The Dark Knight has brought together some legendary creative duos over the decades. The '70s gave us Denny O'Neil and Neal Adams. In the '80s, it was Frank Miller and David Mazzuchelli. And, most recently, we have the mighty team of Scott Snyder and Greg Capullo. Their nearly 50-issue run on Batman was the backbone of the New 52, and one of the best interpretations of the character, in an era where it's sometimes hard to tell fresh stories about the Caped Crusader. Now Snyder and Capullo are reuniting, telling a story not just about Batman, but one involving the Justice League and the entire DC Universe. Dark Nights: Metal is a new six-part mini-series event that begins in August and takes things cosmic, as story elements that Snyder and Capullo introduced in Batman way back in 2011 begin to pay off in ways no fan probably ever expected. At this year's San Diego Comic-Con, I got the chance to chat with Snyder about Metal, about what it means both for the DCU going forward, and for his partnership with Capullo to date. "When we started, I didn't even think we'd make it through even an issue or two," Snyder said of his and Capullo's relationship. "We were always down each other's throats. But then we really fell in love with each other's work first, and then with each other--he's like a brother to me now." Even after the end of their Batman run, Snyder and Capullo "were always talking to each other so much when we were off, about Metal and everything." Before Dark Nights: Metal begins, two prelude issues came out over the last few months - Dark Days: The Forge, and Dark Days: The Casting. In these two specials, fans learned of a vast web of connections that goes back in time to the earliest days of the DC Universe, and involves some characters DC fans haven't see in years--many of whom we had assumed were wiped from continuity (I'm looking at you, late '80s version of Starman). So will Snyder exhume other lost characters from DC lore with Metal? "Yes, there's some super deep dive stuff," Snyder said. "Things like [Metal Men creator] Dr. Will Magnus and [JLA villain] T.O.Morrow, and other fun stuff in Metal, and beyond that, secret histories of characters that I haven't had a chance to write before, but that I also get to bring back from obscurity, and I'm really thrilled about it." He continued, "Metal is something that felt like Crisis On Infinite Earths in that way, but didn't quite use the same pieces from before. I've read so many great stories about Alexander Luthor and the Anti-Monitor or the Monitors, done in all kinds of amazing ways by different creators, and didn't want to go back to that well. So I thought, 'What if I do something where I create a whole new area of the multiverse, with new villains instead?'" Yes, Dark Nights: Metal will introduce a whole new aspect to the DC cosmology--the Dark Multiverse. So what inspired Snyder to come up with the concept? Turns out, it's kind of rooted in real life science, and a show featuring one of our most beloved real life rock star scientists. "I love Cosmos with Neil Degrasse Tyson, and my six-year-old loves it too," said Snyder. "And one episode was about dark energy and dark matter, and it's a fairly recent discovery that dark energy and dark matter exist, and that they essentially [make up] the majority of the universe, and we can't perceive them except for their effects. So I started to think about: What if there is this construct in the DCU where the Multiverse is this tiny thing that floats on this roiling ocean of darkness?" Clearly, this is a topic of great interest to Snyder. "Grant Morrison's explanation for the Multiverse as this set thing is something that I love, but what if the Dark Multiverse was the subconscious?" he said. "What if this was some kind of dark, volatile fluid place that reacts to our hopes and fears. So if you fear something when you're down there it materializes, and when you stop fearing it, it goes away. And those worlds bubble up and are hellishly kind of fluid. What if that suddenly broke though and came here?" That scenario is what lies at the core of Metal. Snyder explains that, of course, Batman is the first one to discover the impeding threat of the Dark Multiverse. "The first wave of attack are these 'Dark Knights' that are his worst nightmares about himself," Snyder said. "So they are super badass, and we've been working on creating them for a long time. They're almost like, 'What if Batman went too far, or went wrong?' in all kinds of different ways. And because they exist as these fears they're possible, whereas in the regular 'set' Multiverse, they wouldn't be possible." Another character created by Snyder, who is finally getting his much deserved time in the spotlight as part of the lead-up to Dark Nights: Metal, is Duke Thomas. 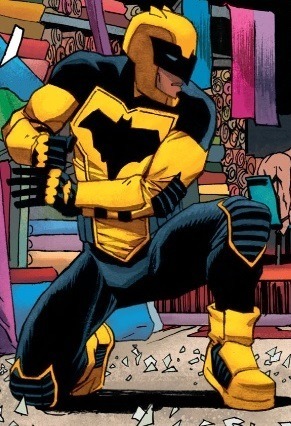 The teenager was introduced in Snyder's Zero Year arc in Batman, before headlining the We Are Robin title. But recently, Batman has been mentoring Duke in a new role--he's a partner, but not a Robin. Now Duke will be going by "the Signal," and Snyder elaborated on his creation's future in the post Metal world. "I've been teasing a story about Duke, and how he's this hero-by-day in Gotham," Snyder said. "What I love is that the Gotham is different during the daytime. New threats are born during the day--threats that by nighttime are ready to fight Batman. And you need someone who is there by day, then meets Batman at the Batsignal and trades information." According to Snyder, Duke's evolution has been in the works for some time. "It's been the plan for a while, and it was Geoff Johns talking to us about it that helped form the idea back when we started Rebirth over a year ago." With his work on Dark Nights: Metal taking him well into 2018, another Snyder Bat-book will soon be coming to an end. Snyder confirmed that he will soon be finishing up his run on All-Star Batman, but that doesn't mean he's done with the Dark Knight. "I'm now doing the story I was going to do in All-Star Batman but in a different way, with Sean Murphy, and in a different format," he said. "The story with Sean Murphy, I started tweeting about it like over four years ago. Sean and I came up with it when we were in Ireland together, all the way back in 2013. This story is one I've been dying to do for years and years, so this is happening 100%--we start on it next month." So worry not, Bat fans. It seems there Scott Snyder has plenty of more Batman left in him - and we are all much better off for it. Dark Nights: Metal #1 hits comic book shops on August 16.